Destination: Chicago - A festival of doing and making for all ages. View the video above and photos with event recap below to see what Destination: Chicago Maker Parties are all about! Hundreds of young Chicagoans, along with their parents and teachers, plus representatives of two dozen youth-serving organizations citywide, converged at Jones College Prep on Saturday, January 24, 2015 for the second annual Destination: Chicago – Winter Break. Presented by Chicago City of Learning (CCOL) and Hive Chicago Learning Network, the daylong Maker Party featured activity stations and pop-up workshops in photography, fashion, engineering, architecture, digital media, music, computer science, choreography, journalism, forensics and more! Taylor and Tamiah’s favorite parts of the day included engaging in Fashion Wars with Continuing Studies at the School of the Art Institute of Chicago, practicing hip-hop yoga with Mindful Practices, and making geometric masterpieces with The Wishcraft Workshop. Others were enthralled by building skyscrapers with Chicago Architecture Foundation, coding with Adler Planetarium, finger printing with Project Exploration, urban gardening with The Chicago Academy of Sciences and its Peggy Notebaert Nature Museum, exploring 3D Design and LEGO Robotics with Best Buy’s Geek Squad, or creating stroboscopic photography with YOUMedia. Additional hands-on activities were offered by Argonne National Laboratories, Chicago Botanic Garden, Chicago Southside Mini Maker Faire, Center for College Access and Success of NEIU, CodeCreate, Comcast, Community STEM Badging Ecosystem, Digital Youth Network, Forall Systems, Hubbard Street Dance Chicago, Best Buy Teen Tech Center Little Black Pearl Workshop, Mikva Challenge, Scientists for Tomorrow, The Anti-Cruelty Society, and The National Veterans Art Museum. “As youth explore what excites them at Destination: Chicago, they find new passions, learn skills and earn digital badges that can propel them along a pathway toward a career,” said Dr. Nichole Pinkard of Digital Youth Network at DePaul University, which leads CCOL in Chicago. Pinkard said that once young people find areas of interest, through Chicago City of Learning’s website they can discover programs to participate in their neighborhood, throughout the city or engage in on-line activities – all of which provide learning, skill attainment and digital badges – an increasingly important measure of learning throughout the world. Destination: Chicago was also a day of awards for many attendees. Leaders from CCOL’s first corporate sponsor, Best Buy, were on hand to announce the individual and school winners of the Best Buy Challenge. Taking home the Chicago Public Schools Awards for the schools that enrolled the most students in CCOL were Chicago High School for Agricultural Sciences and Mark Sheridan Elementary Math and Science Academy. As their prize, each school will get a full day’s visit with Best Buy’s Geek Squad – during which students will learn the latest in digital printing, video production, sound technology and more. In addition, Alex Pei of Lincoln Park, Zulieka Rudd of Brighton Park, Robbie Austin of Irving Park and Marlena Sykes of South Shore–were awarded iPads and laptop computers for their individual accomplishments during the Best Buy Challenge, a Playlist of five online activities. Taking home a digital camera was Heikki Espinoza, who completed the CCOL Scavenger Hunt Challenge. And leaving with an iPad Mini was James McClelland of Roseland, who completed Chicago City of Learning’s Winter Break Adventure Challenge. Thrilled to win a laptop, courtesy of Comcast, in the day-of raffle, which youth were entered into when they turned in a completed Exploration Ticket, was Alana Newsome of Glenwood. For the first time teachers were invited to attend Destination: Chicago on the Teacher Track, presented by the Center for College Access and Success of NEIU as a part of their efforts with Hive Chicago to connect schools with out-of-school learning. “I wish all of our professional development programs could be like this,” said Leticia Medellin, a teacher at Donald L. Morrill Math & Science Specialty School. 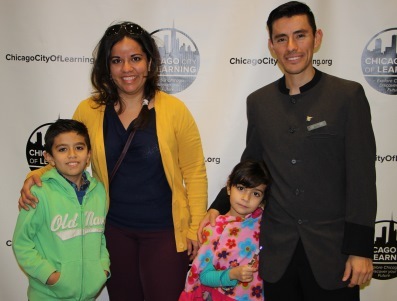 Chicago City of Learning is a city-wide, year-round program that focuses on connected learning in which skills are garnered in the process of actively engaging art, science, writing, game playing, design and more. Digital badges are awarded to recognize skills garnered. CCOL is led by the City of Chicago and Digital Youth Network at DePaul University, partners with Chicago Public Schools and is supported by the John D. and Catherine T. MacArthur Foundation, Best Buy and Comcast.